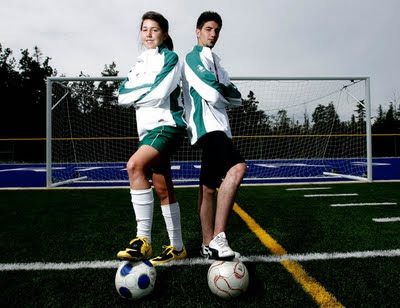 This was the second shoot done for this series, this time it is soccer players Cassian Ferlatte and Marisa Duguay. As previously mentioned, the first day of shooting was an overcast day. Which is good in that the light is lower and makes for better flash control, but the skies tend to be gray and boring. When I started this whole series, I took the time to find out who I was shooting and tried to come up with ideas beforehand. 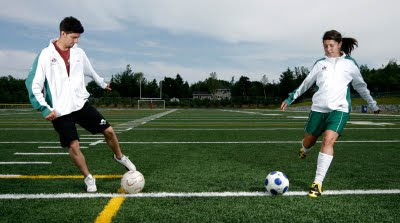 For the soccer shoot, I envisioned a player leaping into the air to do a flying kick lit up by cool flash, kind of in the vein of this, done by one of my former students Georges Long, an amazing photographer who after the second class I think I asked him why he was taking the class! But it turned out there would be two players for the shot and I didn’t think I could get the co-ordination required for that kind of shot with the two of them. I did try some shots of them shooting the ball towards the camera, but since they were focusing on striking the ball, their faces weren’t as visible. Also there was the potential damage to myself or the camera if they didn’t kick the ball high enough, so I moved on to a different set up. Tried some shots of them in front of the goal, lit up by a flash on either side, which created some interesting cross lighting. Editors always like choice, so I always try to shoot horizontals and verticals. Just to mix it up a bit, I tried switching the WHITE BALANCE on the camera to OVERCAST(or cloud on some cameras) which warmed up the tones. The shots that I really liked however were with them framed by the goal net. I set them up on the other side and went behind the net to frame them. To play with the color a bit, I also shot with the camera WHITE BALANCE on TUNGSTEN(or INCANDESCENT), which turned everything blue, and putting a CTO warming gel on the flash to warm up the flash. For the next few shots, I used a flash placed on their side of the net to light them, and lit up my side of the net with another flash. That flash was placed high in the air and tilted down at a sharp angle so it would only light up the net and not the players. I also tried some “monster lighting” on their side, but I didn’t like it as much.